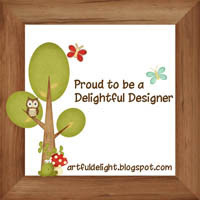 I saved my favorite project created from the Artful Delight Card Kit to show you last! It was so simple to make too! 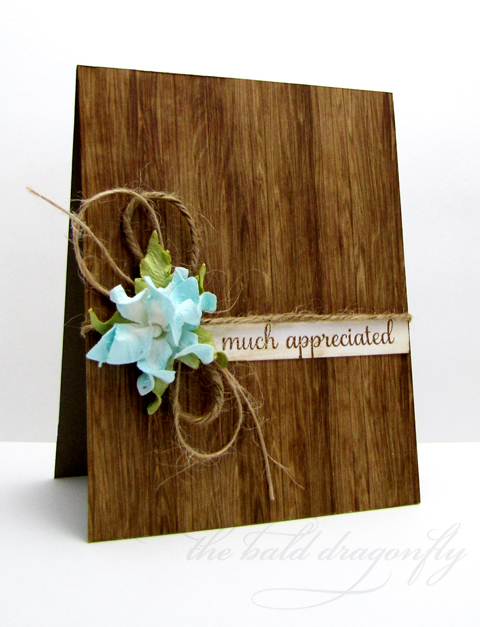 I cut a card base from the nice, thick card stock included in the kit, adhered a panel of patterned card stock from the kit, and added a strip of cream paper stamped with a sentiment from the awesome stamp set from the kit. To finish it off, I wrapped the card with some jute twine and topped it with one of the beautiful flowers from the kit too. 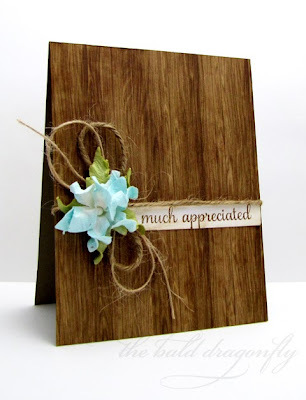 Remember that Artful Delight offers both a card and scrapbook sketch challenge each month, which you can find details here- please be sure to check it out!! My world of things to color just opened up when Faber-Castle paired with May Arts! I love the look and soft, shiny that the creamy Gelatos gave to the stock white wrinkle ribbon. 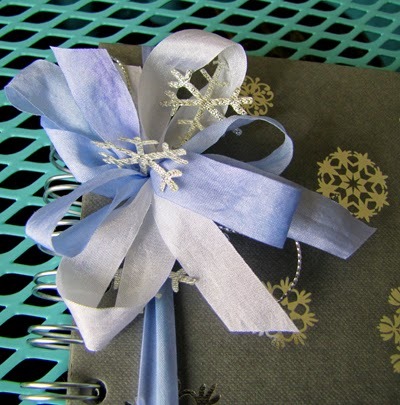 I customized the white ribbon to be a frosty mix of purple and blues to create a Binder Band for a standard notebook. No need for gift wrapping this gift-the presentation says it all! 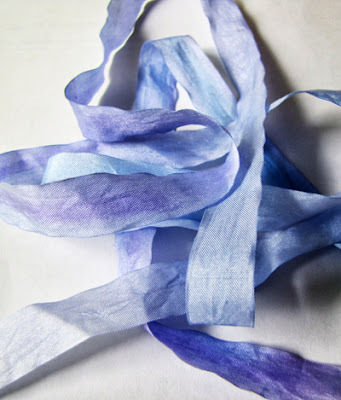 It was so fun to have the ability to control the color on this ribbon by using the Gelatos. I simply colored strips of the purple, blue and green right onto the ribbon and then soaked the length of ribbon in water and let it dry. The end result was this dreamy, shiny ombre effect! I found this pretty notebook that I got at a value store, but wanted to jazz it up a little bit to make the perfect gift. 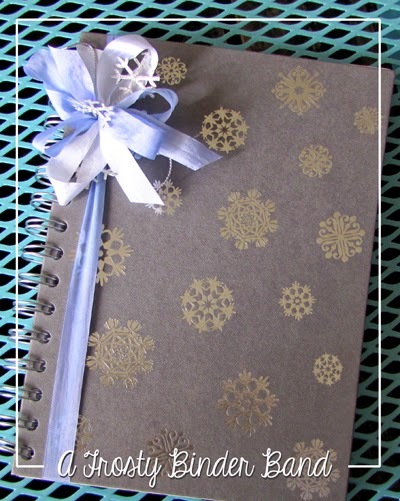 Sometimes it is nice to go without wrapping paper too-either I don't have it on hand or I want my gift to stand out from the others, so this Binder Band has a dual purpose. I wrapped the length of the colored wrinkle ribbon over the front of the cover and tied tight. Before tying a bow, I added lengths of the regular white (un-dyed) wrinkle ribbon and a bit of the leftover died ribbon, along with some amazing May Arts metallic string in silver. So then to make the big, puffy bow, I tied a bow in different levels of each of the ribbon, and each level was tied on top of each other. To finish the bow, I tucked in some May Arts Silver Cutout Snowflakes. 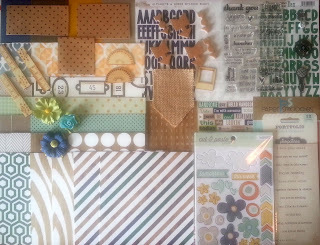 There is some amazing inspiration to be found along the Hop! Please be sure to check out the schedule below, as well as the May Arts Blog, and leave comments for your chance to win some ah-mazing May Arts and Faber-Castle products!